Crush graham crackers until fine. Pour into ungreased 13x9x2 pan. Add melted margarine. Mix well and press to cover bottom of pan only. Add boiling water to both packages of Jell-O. Mix until thoroughly melted. Add softened cream cheese and mix with electric mixer on low to med speed until well blended and frothy on top. Add strawberries then fold in Cool Whip. Cool Whip does not have to be blended thoroughly. Pour over graham cracker crust. Chill at least 3 to 4 hours until firm or overnight. 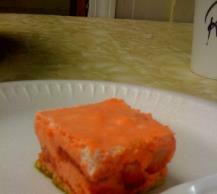 Cut into squares and serve with a dollop of Cool Whip on top.